Among all the anniversaries these past couple of weeks (41st of Apollo 11 and 60th of the first Cape Canaveral rocket launch are two of them) there is one that is noteworthy for the computer geeks among us (you know who you are). In the dark ages of the mid 1980s, when IBM compatible PCs had 4 color screens, beeps that barely passed as sound and an operating system that looked like a '>' symbol, out came a computer with preemptive multi-tasking (in layman terms, real multi-tasking, which Macs didn't have until years later), thousands of colors, stereo sound and a graphical user interface - the Amiga 1000. To reminisce in case you're an Amiga fan or to learn more about the Amiga tumultuous life, PCWorld provides a very nice walk down memory lane in this article. No, I don't want to start a "Who was first" debate here (we all know it was Xerox). I was one of those geeky kids with an Amiga computer, playing games, creating boot floppy disks that contained entire development environments and had a SCSI 120MB hard-drive while everyone else had the beeps and poor graphics on their huge IBM-compatible PCs. 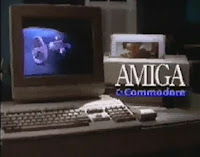 What does the Amiga computer have to do with space? Buzz Aldrin: "Yes, Mam. We'd like to compare notes with Stevie on the new space station." Standing next to Buzz are two of the original Mercury-7 astronauts Scott Carpenter and Leroy Gordon Cooper (thanks for your help figuring this out, @flyingjenny and @iammdsquared). Yes, back in those days (1986) the planned space station wasn't international, it was called "Freedom" and had a centrifuge module for artificial gravity research. Neither Freedom nor the centrifuge ever materialized, just like the Amiga never took the world by storm and about ten years later became all but a thing of the past.